We,SROCmembers, support theNissan Revival Plan. A copy of letter to the NISSAN MOTORS is here. Mr. Claude RICHARD, who lives in the south of France, owns two Datsun roadsters 1968 and 1970 SRL311. Look at the photos of his roadsters and visit his on-line shop of French wine. 'Shimanami Kaido', a series of long bridges and highways to connect the Honshu and the Shikoku Island over the Inland Sea in Japan, was officially opened on May 1, 1999. The merry and crowded celebrating events were reported in TVs and newspapers in Japan. As one of the events, 'Marriage on Bridge', a public wedding ceremony on the new bridge, was held on April 24, where our Datsun Roadsters played an important role. By Rob Beddington from Nottinghamshire England. He runs the Classic Fairlady Roadster Register. He has a 2000 and two 1600s which have appeared at many shows, in books and magazine articles. He has owned Fairlady Roadsters for over 5 years. He also has a huge archive of Fairlady sales literature and articles. An enthusiast in UK, Mr. Keith Purdon, sent us a report on his SPL311 Datsun Roadster with beautiful photos. Do you know a Digital Paper Car? Cut out and paste a paper pattern, and you can assemble a cute paper car. We found the legendaryDatsun Fairlady S in a Digital Paper Car Book. The 1998 SROC Summer Meeting was held on August 22 and 23 at Yamada Ryokan Inn of Otari Hot Spring in Nagano Prefecture. This is a report of the Meeting. The EBBRO KID BOX of Japan will release the second series of die-cast Datsun Roadster model cars. This time, racing models. We got the photo. The big event in Australia "Datsun Roadster National Meeting" was held on June 5 - 7. We received a special report and photo from Mr. Bruce Campbell, President of Datsun Roadster Club of Victoria. The EBBRO KID BOX in Japan has released 1/43 scale die-cast model cars of the Datsun Roadsters. The 1998 Spring Meeting of SROC was held near the Fuji International Speedway. This time we had a special guest from the United States. This is a heartfelt story of a Datsun Roadster which miraculously survived the disastrous Kobe earthquake in 1995. The SROC participated the 1998 Classic Car Festival held in February, 1998 at Pacifico Yokohama, leading the parade with 30 SP, SR and CSP Datsuns. Some of the historic sport cars of Nissan were exhibited. 1997 All Japan Datsun Roadster SP/SR Meeting was held in November, 1997 at the Fuji International Speedway. Total of 125 SP, SR and CSP roadsters were gathered. The roadsters ran the famous Fuji Racing Circuit, where the Datsun Roadsters lighted the dawn of Japanese motor sport almost three decades ago. The Milky Way - Blue Island Rally was held in November, 1997 in Shikoku Island in Japan. More than 30 Datsun Sports were gathered there, not only from the Island but also from the western region of the Honshu. The Meeting celebrated the 15th Anniversary of the SROC-Ehime. 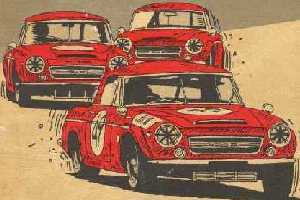 Enthusiastic and nostalgic photographs and illustrations of Datsun Roadsters. Roaring exhaust note of SR311 hill-climbing the winding road of the Mt. Norikura. There are many beautiful web pages on the Datsun Roadster in the Internet. Some of the enthusiast sites are picked up here for your surfing convenience. Greg Valazza of USA presents very beautiful pages featuring the former model SR roadsters. Mark Dent of USA features advertisements and meetings of Datsun roadsters in the US. SoCalROC are not just members of a car club, but we are truly friends who are here to help each other. Rob Beddington of Nottinghamshire England runs the Classic Fairlady Roadster Register. Marc Sayer is the Editor/Publisher of "Z Car & Classic Datsun Magazine". Effort to organize the SP/SR Owners' Club was initiated by a one-line advertisement in the February 1974 issue of "Car Graphic" magazine, saying "For Sale - Canvas for a soft top". The person who placed this ad was Chairman Takahashi of the present SROC and several Datsun roadster owners who responded to the ad were caught(?) to start the club. Then, they made planning and preparation to organize the club. In April, 1975 the first meeting of SROC was festively held. The club is for the SP/SR Roadsters only. The SROC started as a "One Make Owners' Club" that was rare in Japan then. Issuance of the Club video "ROADSTER"
Interchange with overseas owners and clubs -- Promoting DATSUN ROADSTER CLUB INTERNATIONAL, exchanging information with owners in US, Canada, Australia, Switzerland, Germany et.al. Thank you for visiting the SROC web site. Could you please sign in the guest book by PUSHing.